I am new the the forum and to the site. This is my first post. I am a machinist out of necessary. I need to repair my farm machinery as the dealers are to expensive for me. 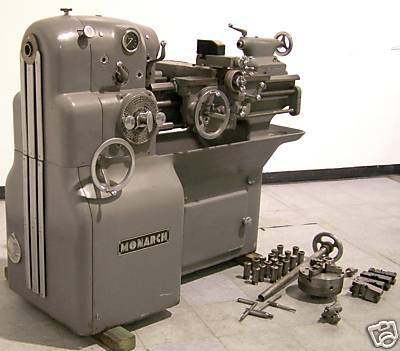 I own a Van Norman model 12, Clausing 5914 12X36 lathe , and Monarch CY 16X48. I have allows wanted a Bridgeport milling machine and a friend of mine called me about one a friend of his had. I called the guy and he was unwilling to sell just the small Bridgeport. If I wanted it I had to buy everything. There is a Monarch 10 ee sn-ee-17702, Monarch series 50 about the same size as my CY. A small Bridgeport, a surface grinder, a Hobart Tig/stick welder and a Bridgeport series 1 cnc 3xis milling machine. There is also some tooling, both lathes have 3 and 4 jaw chucks and steady rests. The small mill has r8 collets and the series 1 has 30 holders. Both mills have Kurt vises. There is misc. cutters and tool holders. I paid $5200 for everything but other than my friends assurance the everything was operational until the previous owner passed away 2 months ago. It is a pig in the poke. Saturday I am to pickup the machines. I am very excited about what I am going to see. I am not a machinist but have some experiences at repairs. I can do bearing fits and cut key ways . I am hoping everyone here will help me learn to use theses machines and I'm looking forward to your opinions. Sounds like you found a bird's nest on the ground. Looking forward to seeing pictures of your acquisitions. I would say you found more than a sweet deal. Welcome to the site. You'll find all the help you need here, I'm sure. We have all shapes and sizes of machinists here, so if you want to know something, just aske. No one will ridicule you for a "dumb" questions. We all weren't born wearing safety glasses and a shop apron. That all came later to us. You have questions, just ask. We like questions. Wow! That's a lot of equipment for that price. We'll be waiting to see the pictures. Lots of help available here, so ask away! As Tony says, we are here to help no matter what your experience level is. They want $5k just for a 'project' 10ee around here so you basically got everything else for free nice score! Thanks for the offer of help. On Saturday I plan on taking my 4k lb fork lift, semi tractor and drop deck trailer plus a goose neck on my 1 ton. The fork lift is all terian 4x4 so once I'm outside it should be simple. I'm a little concerned on how to pickup the mills. I have moved my other lathes and I feel OK moving them. The cnc machine really concerns me. I assume I unhook everything that plugs in. turn the head upside down on a wood block and run the table up till it helps support it. Where do I hook my lift straps. I also believe I need some old blankets to protect straps from sharp edges. On an other site someone cautioned something about glass under some shield that if I break it . I'm out a grand to repair but there were no pictures so I am not sure what they are talking about. I think it has to do with the digital readouts which is on both mills. I was told machines are very dirty so I was going to blow them off outside before I bring them in the shop. I'll try to take lots of pictures then I need to learn how to load them here. Anything else I need to be considering? At this time I want to get the machines home and play with them. However I can't see where a cnc milling machine comes into repairing farm equipment. I might sell it down the road. To tell you the truth the g code in the books seems confusing as of now. As for the rest of the machines i think it would be nice to set up the 10 ee with the colletts which are included. Leave the series 50 setup on a 3 jaw and set the CY up on 4 jaw. I am getting ahead of myself. They might be nothing but some big boat anchors. I sure hope not but at the price I figured I could part them out and get my money back. I normally lift knee mills by putting the straps under the ram, one on each side of the column or slide the forks under the ram and place a 2x4 on top of the forks. If I use straps, I use a few layers of cardboard to protect the straps from the sharp edges. As far as handling the CNC, if it has a separate cabinet then it should disconnect with plugs, if not, then just secure anything movable and lift. It is better to transport a knee mill with the knee cranked all the way down to avoid damaging the screw, also lowers the CG. The surface grinder is top heavy and there is no good place to grab them. It's best to get them strapped down to a heavy pallet before moving. It sounds like you are well equipped and have the experience to handle the machines, so I don't think you will have any problems. I'll take a couple of heavy pallets, straps and some additional blocks 2x4's and the like. I think the cnc mill weight is 2500 to 3000? Thanks for the picture and I really did not want to mess with the head. I'll let everyone know how it goes. I think the cnc mill weight is 2500 to 3000? Jim how big is that orange beast it makes that knee mill look like a kids toy. You are also missing a lug nut. Ha its named Highlander, there can be only one! The 10EE would have originally had a motor/generator (MG) drive with a DC spindle. They were very robust and had incredible variable speed control, lots of low end torque, down to about 8 RPM. If it has the original drive, don't let anyone talk you into "upgrading" it to an AC motor with a VFD controller; you can't beat the original DC drive. I know all about that drive and can help you with any problems. Cal, I am going to take everything slow. I like to do some research before doing anything. I'm working on getting everything picked up tomorrow. I must admit I fear I might end up like the bad little kid that his parents put horse manure in his Christmas stocking. He was all excited because he figured if there is horse manure there has to be a pony somewhere. I never know about a monarch 10 ee until I had already bought it. I'll let you know what I got tomorrow. I plan on taking pictures and posting them on here. Thanks for your offer to help me if it is a problem. I have a 3 phase generator that runs on natural gas. It is a Leroi 220 75 kw about a 1940. I have my own gas well. I can always run it off of that. I made it home the lathes are dirty but look good. The 10ee has a missing name plate. Can anyone tell me where it should be and where else the serial number might be. it has been modified to a ac motor and a vfd. I have the machines unloaded and will start cleaning them up tomorrow. I have lots of pictures but I don't know how to load them on to the computer. I'll get my daughter to help me tomorrow. The good news and the bad news on the 10ee. The motor/generator is gone and someone did a poor installation of a 3 hp 3 phase motor with a vfd. The name plate is gone. I am missing a small door (right next to your left foot). Back lash on cross feed .014 carriage backlash is very large. The 3 and four jaw chucks have been prerusted for me. Good new is there is very little if any rust. I am interested in an information on where to look for the series number stamped into the machine. The machine has the round chart for speeds and pitch.The tachometer is round and 2500 rpm max. The steady rest seems correct . Tool holder are nice and not rusted. I plan to test run the lathe today or tomorrow. I'll let you know how it goes. The 10EE's serial number should be stamped on the right end of the bed, in front, between the flat way for the tailstock and the Vee-way for the carriage. Cal, Thanks the stamping is inspected by HGB Lot No ee6904 I am trying to attach a picture. That's an old one. With that serial number, the machine probably had a Sundstrand hydraulic drive. Is there round hole in the big cover on the left end, the one that covers the spindle motor? I think you are probable right. The cover has been replaced by a shop made cover. Do you have any pictures of the old 10ee with hydro drive? Did you look at the picture on pm? My lathe bottom does not extend to the end of the bed. I think I got it to load on here. As you can see it looks different from the other 10ee I have seen. Please let me know what my options are to restoring it. Is the old hydraulic drives available? Cal, I spoke with Monarch today and they said the machine was produced Nov 30 1939. It was a hydraulic drive and to his knowledge there is nobody working with those old drives. 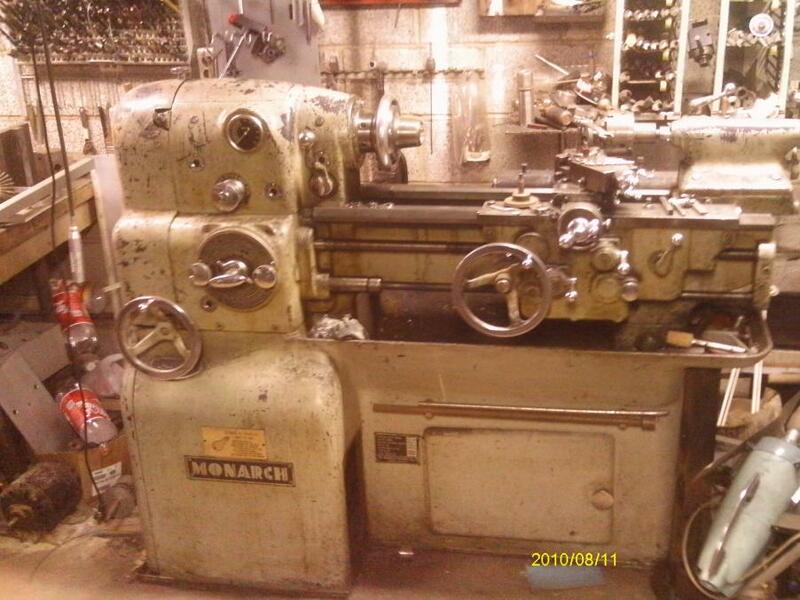 He said Monarch would not rebuild that lathe as it is to hard to acquire parts. He thought I might consider replacing the 3 hp with a 7.5 hp vfd. He said they do a nice job. What say you? I guess the size of the VFD would depend on the size of the motor. If the motor is 7.5 HP and you have 3 phase power in your shop then a 7.5 HP VFD would be fine. If you have only single phase power then I would go with at least a 10 HP VFD. If your motor is 3 HP, then the VFD that you have will work fine. The big handwheel to the left of the quick-change gearbox controlled the hydraulic drive unit. These were the first generation of the 10EE, the last of them were built at the end of 1940. There are a few still in operation. Run it for a while with the existing drive before you worry about replacing it. A 7.5HP VFD is probably your best bet for a replacement, assuming that you have the space. AFIK, 7.5HP is sufficient for normal use. I spoke with Tim at Monarch about operating the series 50 on a vfd. He said to use a rotary phase converter It is a 10 hp dc drive motor. The vfd might play help with the rectifier. I have a 7.5 Rotary phase converted. I also have a 5 hp 3 phase motor. I was going to connect it up and start the 5 hp motor then turn on the lathe. Anyone try this before. I know this equipment runs on smoke because when you let the smoke out they don't run anymore. Does the lathe have the original MG setup or has it been repowered? If original, then the RPC should work, but it's a bit light, should be at least 10HP. If the lathe has been repowered, and driven by a 3 phase motor then the VFD should work. Not really sure what you have there. If you can get some pictures it would be helpful. This 10EE never had a MG. It is the earlier version with the Sundstrand hydraulic drive, which apparently has been removed. Unfortunately, without the back gear unit that came with the DC drives (be they MG or tube), the machine won't have nearly as much torque at low RPMs when running from an AC motor and VFD. I don't know very much about the series 50 drives, but it having a DC spindle motor doesn't sound right. If it's the typical 3-phase AC motor, a RPC would be a better choice for a motor that big. A VFD that can run a 10HP machine would be very expensive. Can you post photos of the data plate on the series 50's motor and the control box? i can not post pictures on this sight. The 50 series has a dc motor. The motor has covers where the brushes are. The I'll let you know how the rotor phase run test works. i can not post pictures on this sight. How can we help you with that? We would love to see your new machines.